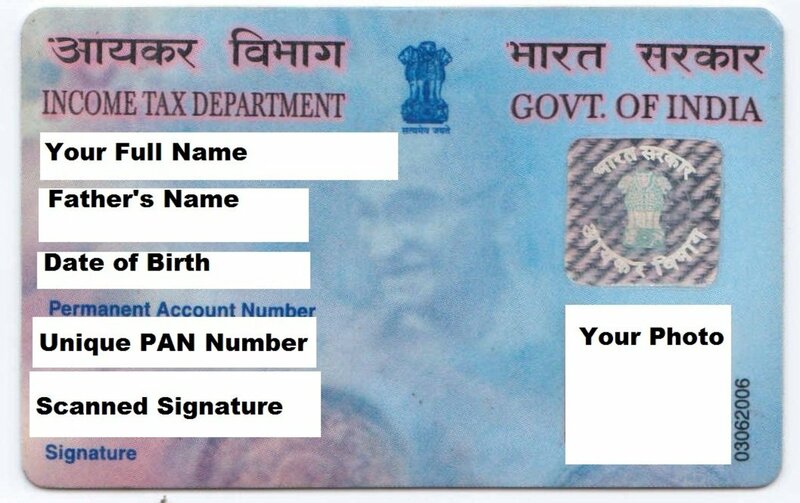 Permanent Account Number or PAN is a mandatory alphanumeric number for people who file income tax and make transactions of Rs.50,000/- and up (like deposits in a bank or Post Office). The rule was made mandatory on 2005 and since then, filing income tax and keeping the track of it has become easier by quoting this number. People need to have this number if they want to use financial services of Government or some private service where the transaction equals or exceeds Rs.50,000/-. 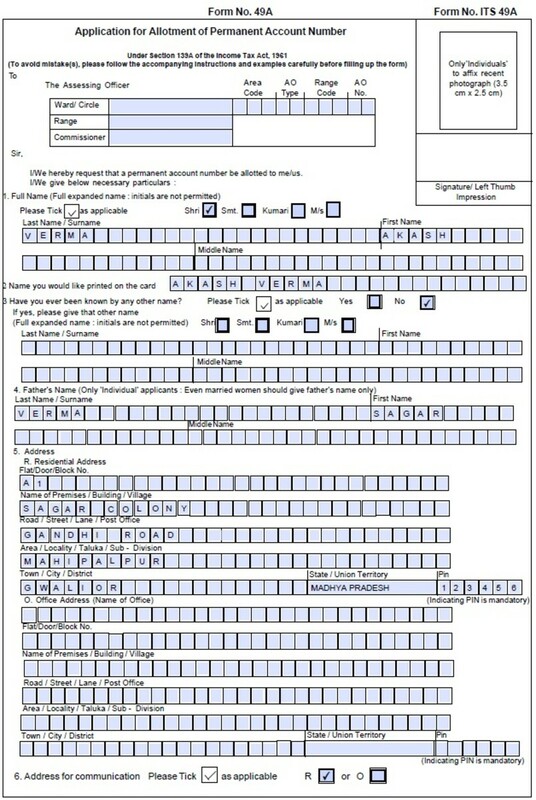 The form is very simple and easy to fill up. It is known as Application Form No. 49A with respect to PAN Application. 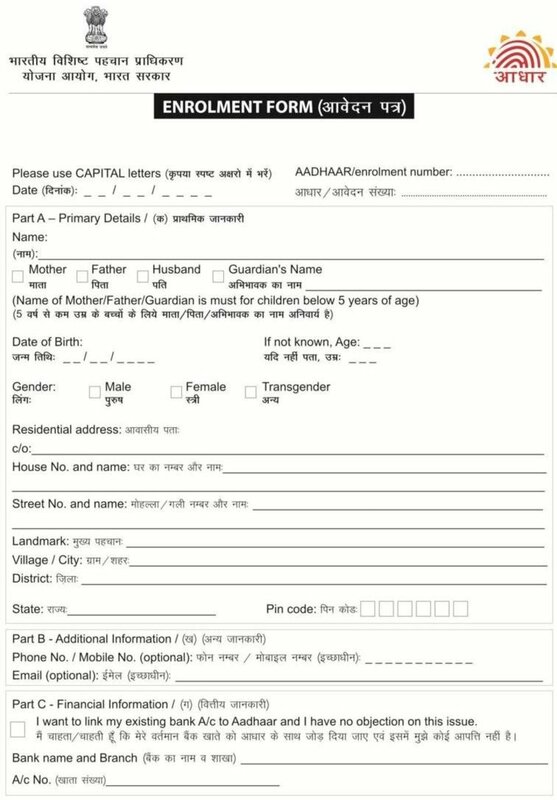 Though the form is simple, I have seen many people get apprehension from it because it is a Government form and the information cannot be incorrect. They think that they will mess up the information and they will be charged for it and that is why they don’t fill the form or wait for an expert to do it. The issuance of PAN causes delay and resources from Government’s side and that is why, it is very important to fill the form in correct order and with correct information to the best knowledge of applicant. Here I would be using an alias to fill the form so that not only I would be able to explain all the fields but also, I would be able to show you how and where the information is filled. 1. Check the box Shri (Kumari if the individual is female and not married, Smt. If the individual is female and married, M/s if applying with respect to a company, it stands for Messers). Full Name: First Surname – Verma and then First Name – Akash. If you have a middle name then you can fill it in the next row where Middle Name is printed. 2. Name you would like to printed on the card – Akash Verma (company name can be used as well). 3. Have you ever been known by any other name? – Tick the box No (if yes then tick yes and fill out your previous full name). 4. Father’s Name: Surname- Verma and then First Name – Manav (no Shri must be filled). Fill up Middle Name if any. Married women must fill the name of their father before marriage and not spouse’s father. Office address can be filled in this same manner. 6. Address for communication: Tick (R). It is best to be contacted at Residential Address because then you won’t miss the card when it is delivered. However, if you don’t have anyone at the residential address to pick up the card, you should Tick Office so that you can pick the same in Office hours. 14. Full details (name and address, etc.) 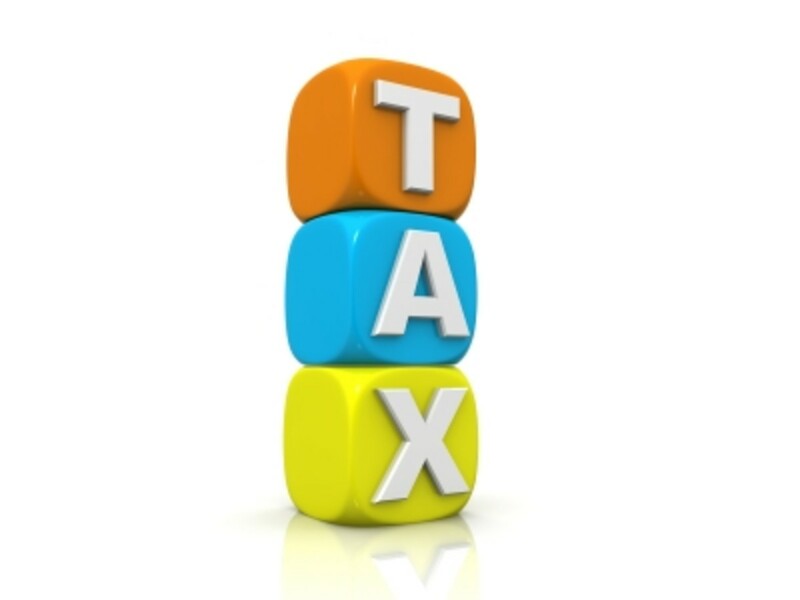 of representative assessee– here you would want your friend to fill up his details if he has been paying income tax and can represent you as a legal and appropriate applicant when needed. 15. I/we have enclosed: Photocopy of Driving License - as proof of Identity and Electricity Bill – as proof of address. I/we – Akash Verma – the applicant, do hereby declare that what is stated above is the best of my/our information and belief. Signature or Left Thumb Impression of Applicant. 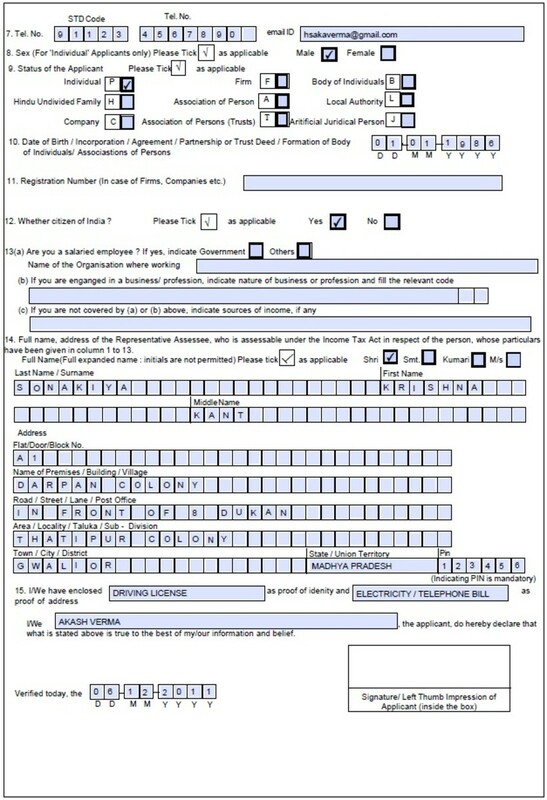 So, this was the whole procedure to fill out PAN application form to submit your income tax on time and keep a track of it by quoting this single number. It must be noted that you cannot apply for multiple PAN. It is punishable by IPC (Indian Penal Code). You will get necessary details regarding policies when your PAN arrives at your doorstep. Thanks for going through the article. Ciao. Note: I created the alias to show you how to fill the form. 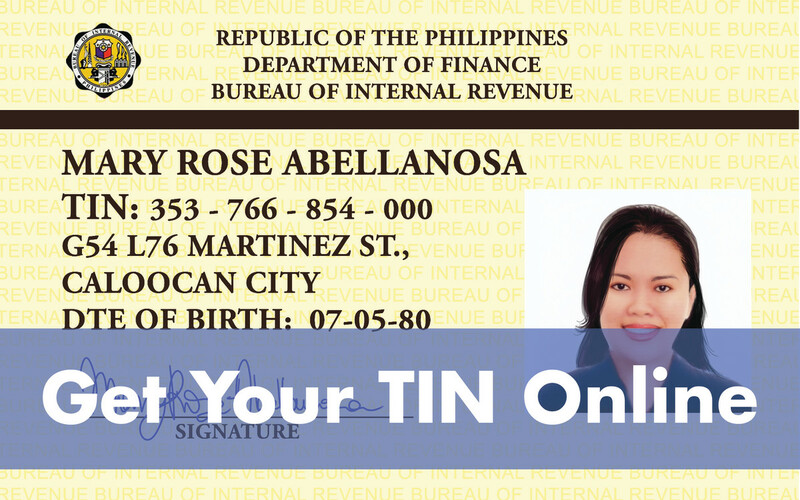 The information may be incorrect but it will give you the idea about how to fill the form. Please do not try to reach me through any of the contacts mentioned because they were for informational purposes only and are not real! Thanks Gunnasai and Thanks Daniel Deepak. Very nice blog it really helps.